There’s a good chance that life itself is causing you to be stressed out, and you feel helpless when it comes to finding something to do to fix the problem on your own. The problem that we often face in life is the fact that there seems to not be enough time in the day to handle all of the things that come up, and that demands are immediate attention. Between handling finances, dealing with bosses or employees, or our relationships – such as those that deal with our spouses, significant others, and children – we just can’t seem to be able to come up for air. If that description strikes a chord with you, and seems like something that you need help with don’t feel alone. Most people struggle with this, and some don’t reach for help soon enough. Some physical symptoms of being stressed are fatigue, headaches or migraines, indigestion or other stomach pains, tight achy muscles, rashes or other skin problems such as acne, and not getting enough sleep. As well, you’re probably an emotional wreck being easily irritated by the slightest thing, as well as often sad and depressed for no reason, and lacking motivation. You may not have even realized that stress was causing these symptoms but likely it is. Imagine waking up in the morning feeling completely rested, knowing that most of what the day throws your way will be easily handled and deflected without any sort of ill feelings and anxiety. You breeze through your day in good spirits and feeling healthful because all the stress that you’ve felt in the past isn’t taking its toll on your body any longer? Feel impossible. It may feel that way now but it certainly doesn’t have to. 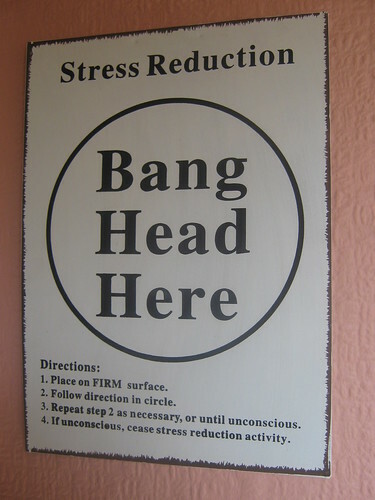 A Solution to Your Stress! So what the heck do you do about all of this, and how do you overcome your stress? Well, it’s simple in theory but not as simple in practice however it is doable if you’ll just take sometime to work at it, and change your thought habits a little bit. A simple two-step process can cut down on a great majority of your stress. First you need to realize that if you have no direction then that mere fact alone causes you to be stressed, simply because the brain is one organ that does not like to be left floundering. So the first thing that you want to do is some planning. Just give yourself some simple goals to shoot for and figure out exactly what it is that you need to do to get to that goal. Second, learn to shut out yesterday and tomorrow and live in the very present day. You can’t change yesterday, so worrying about it is ridiculous really and as far as tomorrow goes, you’re not there yet so you really can’t do anything about that either. You can however do everything in your power to make sure that today is the best you can make it. Focus on today’s activities, and live everyday to its fullest while living in the moment, and watch your stress levels fall dramatically.